Dr. Schtein, you are very immature. Unfortunately, in the world this comic’s set in (the 1950’s of the future! ), people aren’t very accepting or understanding of different sexual orientations. Actually, folks aren’t very accepting in general. It’s a distrust of foreign cultures and ideas, mostly, mixed with good old fashioned repressed victorian standads and ideals. Oh, the 50’s! You so wacky! Couples sleeping in seperate beds, but also you can buy vibrators in the Sears catalogue? Make up your mind! Langstrom had to remain closeted or else he’d risk his career. Especially risky with a teaching career. His friend Dr. Auditore was outted, unfortunately, and now the only job he can get is as a drug rehabilitation counselor at a prison out in the middle of nowhere (and only because his friend’s sister runs it). The only worse thing worse for your career in this universe is to be labelled a commie. Aw man…usually I enjoy gay characters, but i can’t remember one ever being the antagonist. So I have mixed feelings. I like Langstrom a little bit more now? Damn. I do find it fascinating because I’ve been researching lesbians literature in the 1950s, what an awful time period. Great setting for a story though! I do like the patterns in the first two panels, they really spice up the background. And liking Langstrom more due to the revelation that he was gay is perfectly acceptable – He’s suddenly got more character depth, especially considering the time period and the effects it would have on his character. That he was “a thieving, annoying jerk ” is less black and white now and up to more interpretation. I think that, since Langstrom was stealing Schtein’s work, it was technically Schtein’s property and he could do whatever he wanted with it – the manslaughter was a totally unforeseen, unfortunate consequence, but saying that it was his fault isn’t the right way of putting it. If someone had stolen my work, I would have done something way more immature than cutting a wire. Yayyy overanalyzation. It was mostly Langstrom’s work. He was a lazy researcher, but he had a good team working for him. Still, sabotage is never the correct answer. Dr. Schtein could have gone to the station director about the security breech, probably. Edelmeyer didn’t like Langstrom very much. And, technically it wasn’t Schtein’s property at all. It was the US Government’s. WHAT sabotage is always the correct answer. I think my utter hatred of plagiarism of any kind is just getting me worked up right now. Well, I can understand his misogynistic act now that I know the truth. Not that that means I can forgive it. And that’s the only thing that’s changed in my opinion. You just won a million cool points. I’ve thought this all along. Exactly like bluesaved said. It’s prejudiced to be upset that an antagonist is gay, and to only want gay protagonists. However, in order to avoid seeming homophobic, any work that has a gay antagonist needs to have “good” gay characters as well. Otherwise, readers might assume that the reason the only gay character is a bad guy is because the author hates gays. Or the author could just be unconcerned about seeming homophobic. see, now that we’ve injected prejudices into it, we can guarantee it’s not prejudiced! similarly, all gay men are friendly protagonists, so we’d better put one of them in also. I don’t like being accused of being “PC”, so I should clarify, it’s not so much that Langstrom was gay that I found myself liking him a bit more. He had a relationship with someone else in a time period based on the 50s. That was a dangerous time for homosexuals, especially with government jobs. Sleep was right, it gives his character a bit more depth. So the fact that Langstrom was taking the chance of being with someone…I suppose I find that sweet. I don’t know the context yet, but that was just my initial reaction. I don’t get it… one of them is a female the other male… where do you get the whole gay angle? As for the whole manslaughter. That was an accident. First time commenting here, haha, though I’ve been reading for a bit. I must say, I rather like how the teeth are in the last panel! Thanks! They were fun to draw. Probably the funnest part of the whole page. Well, I sort of doubt Leon will be an antagonist. Leon’s too sad and depressed to be an antagonist. Oops, sorry, I meant to make this a reply to a comment earlier, so it seems grumpier out of context! Great page…I love the slow fade from black to blue in the background as he starts to become more aware, and the way you can just hear him saying the last line. No waaaay. Also, that pathetic vase. Probably the most pathetic vase in the world. It must be someone’s favorite vase. Why else would they keep gluing it back together? That last panel is just way too hilarious. Face-palm! Love the heavy blacks in the background. Oh, and I think Schtein has beautiful ears. Just thought you should know. He has pointy elf ears. I think I saw someone with ears almost that pointy once in real life. Crazy! That vase is cracking me up. Someone still had hope for it! Your pun is cracking me up. Ohohoho. It is too late for me to be awake. Haha! Schtein’s acting like he’s a fourteen year old girl, giggling over some new gossip. He’s the most immature thirty-something. Yeah, that and being legally dead has pretty much terminated his legitimate career hopes. Schtein’s face in the last panel, oh wow. I love that transparent curtain in the last panel. My new favourite character. Schtein’s mind is decorated like his mom’s house, probably. Horrible wallpaper patterns, covered furniture, doilies. Is it just me, but have Schtein’s side burns further retracted during this whole prison scene? I went and looked through the first chapter, and man, they were all over the place before. I actually have a formula for drawing them now, so they should be the same from now until always (unless he gets a different haircut or something). Anyway, they’re always retracted like that. He’s not supposed to have sideburns. Of course Langstrom is attracted to a submissive person, haha… But hopefully it was deeper than that. Leon’s just his type. Facial characteristics like a large nose, kind eyes, and softer body, shorter. Dark hair. The submissiveness just cements it, since their personalities complimented each other. Langstrom sort of used him, though. So maybe not much deeper. have we met this leon guy yet? because you’re normally so very secretive about this stuff. and you’re not being secretive. have I just missed something? Not just yet, but I figured since the major secret part about Langstrom is out as of wednesday, I might as well upload character sketches of Leon as incentive on topwebcomics. You know, what the hell. I don’t know, I could stand to be more secretive. you could, but where would the fun be in that? totally love the backgrounds in this chapter. the transparent curtain is the shizz, btw. I knew it. I so knew it the second jacob said called langstrom ‘fruity’ and mentioned his killing langstrom that would make schtein ‘popular’. I was like ‘no way’ and this page was like ‘yes’. Would it be percieved by inmates as a lover’s quarrel gone too far? I dunno. Also, didn’t langstrom say something about delia not being his type? Beyond her being ‘ethnic’? Or is that totally just me reading into it? Whatever, i love the backgrounds and everyone’s sharp teeth. It’s awesome. Well, he meant Schtein would be popular because he killed the warden’s brother. And what prisoner likes the warden? So it’s like a point of honor. Oh, but, bonus points for catching the fruity comment. Delia wasn’t his type because the only type of woman he was looking for was one his mom would approve of so she’d shut up about him being a bachelor. Yeah, you can almost hear the record scratch sound effect, there. In that final panel, you captured that laugh PERFECTLY. Angle be darned! Although I gotta question–why would Langstrom ask Delia out if he played for the other team? Besides the fact that he loves to hear himself talk. He said it himself, his hobby was taking what Schtein wanted. It’s called a ‘beard’. Using someone of the opposite gender to make yourself look straight. :) It’s supposed to help keep yourself closeted. Hah, yes, this was totally going to be my reply. Oh Please I want More you got this Evil side of Me Wanting to Know More..
And then I promptly forgot about this, and completely missed the “close” implicatications in the last strip until someone else pointed it out. <3 BEAUTIFUL! 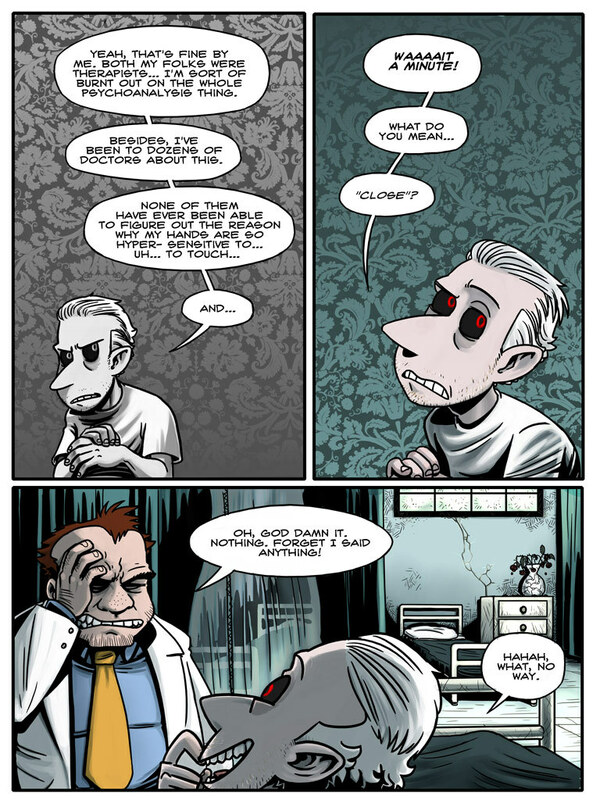 Mr. S has a monkey face on the bottom panel! He is quite gitty about this, no? But, I do have to say EPIC FACE to this! It’s the backround to my iPod now. Where’d your twitter feed go? It was cluttering up the sidebar. I got too many links. I’m trying to figure out a better place to put it.